The European roller is covered with light blue feather around their heads, necks and abdomen. The outer edge of their wings have blue wing feathers. They have black wing-tips. They are small stocky birds that are approximately 11 to 12 inches in length. 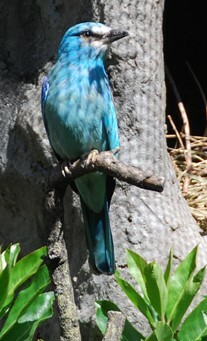 The European Roller uses scent as a deterrent to predators. Chicks are known to regurgitate a foul smelling secretion that predators avoid. Adult birds are also known to regurgitate as a defensive mechanism. Conservation: Birds are hunted for food which has resulted in a depletion in their population unmbers in the wild. The loss of their breeding sites due to conservation to agriculturan lands has also had a detrimental effect on their free-ranging populations.